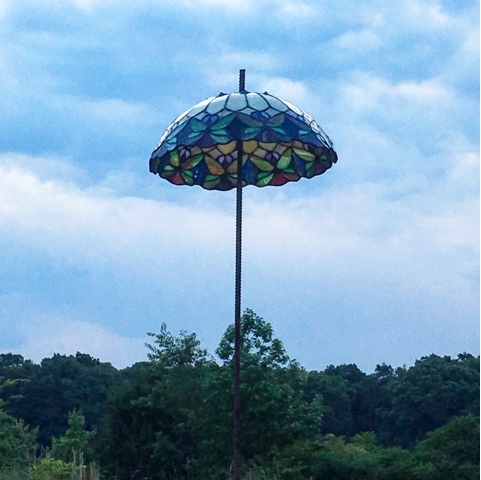 I had several old tiffany lamp shades that I had collected to use, somehow... They have been in the garage for ages, still waiting for inspiration. When the garage was being cleaned out on Saturday, inspiration hit and I asked my welders if they would weld me a large washer around the top of the rebar so that I could put this lamp shade on top, where it wouldn't slide down. They fired up the welder and had it accomplished in no time flat. I LOVE it. It's exactly what I was wanting and the light is beautiful shining on it and through it. The picture above was taken early this morning, the sun is just peeking out, but later it will shine! 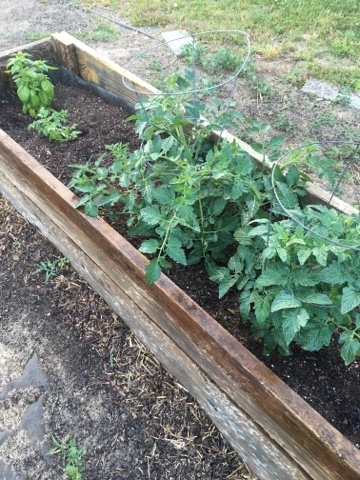 The tomatoes are growing nicely. I had to stake them to keep them from getting to willy nilly. Tomatoes can be likened children... stake them close so they can grow up strong and tall. Sending lots of love and appreciation to any of my 'woodshed' moms reading this. Thank you for teaching me that lesson so long ago! 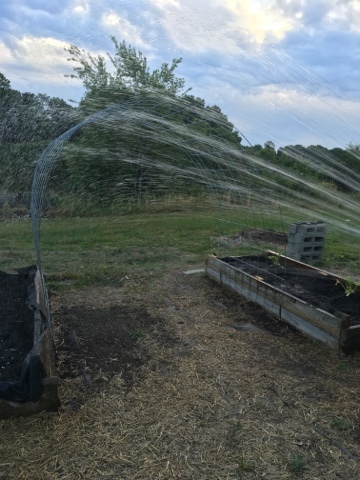 I've been having to water the garden because we have had NO rain... at all! It could be the start of a VERY dry summer. 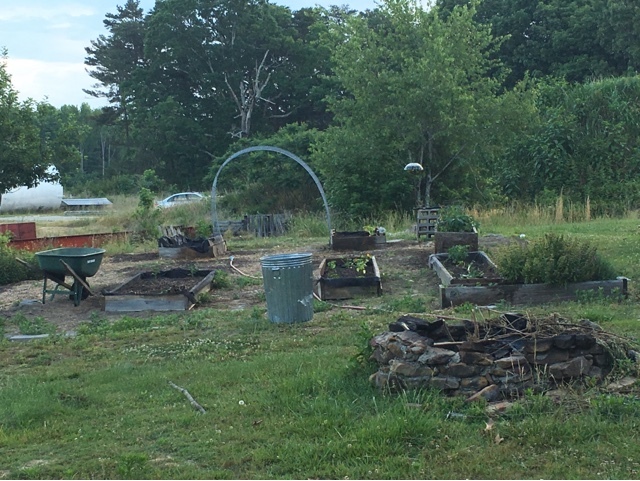 My trellis is leaning a bit, but I still love it. 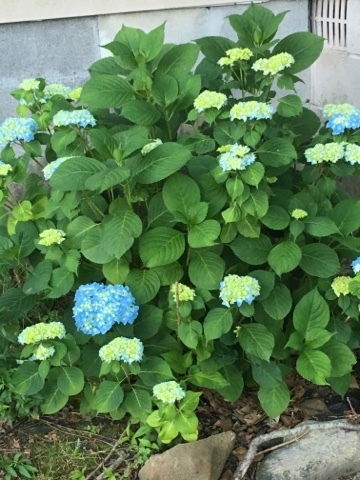 The back yard hydrangea is starting to bloom too. I can't wait to pick some bouquets! Love! 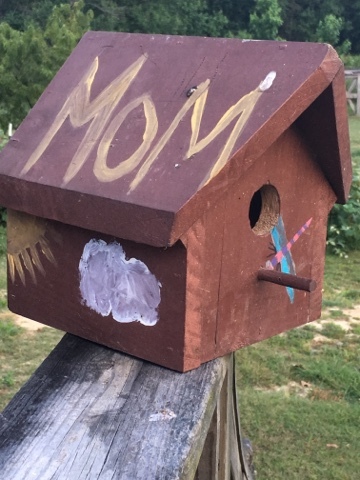 Another sweet find when cleaning out the garage was this birdhouse my kids painted for me many years ago. I promptly brought it back out and put it on the back deck. Sweet memories. Have a wonderful Memorial day weekend, friends! I would love to come stroll through your gardens with you. I have a tomato plant that I am babying. It is in a container, I keep it close to the house, I check it for bugs and slugs. ...can't be too careful, right?